Did Anyone Else Notice Amazon Just Launched A Hard Bundled Music Phone? Amazon’s long anticipated Fire smartphone was launched to much fanfare last night and includes a host of features designed to make it stand out from the pack. But one detail that seems to have slipped beneath the radar is that, for now at least, it includes a year long access to Amazon Prime, which following last week’s music announcement, includes free access to an ad-free on demand streaming music service. What this means is that Amazon have launched a smartphone that gives you a year’s worth of unlimited free music. 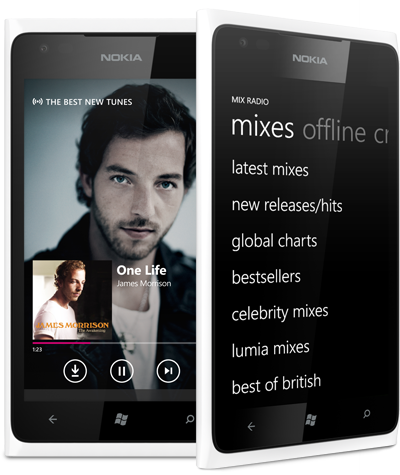 Six years ago when Nokia tried to do the same with Comes With Music the concept was ground breaking and looked set to change the future of digital music. 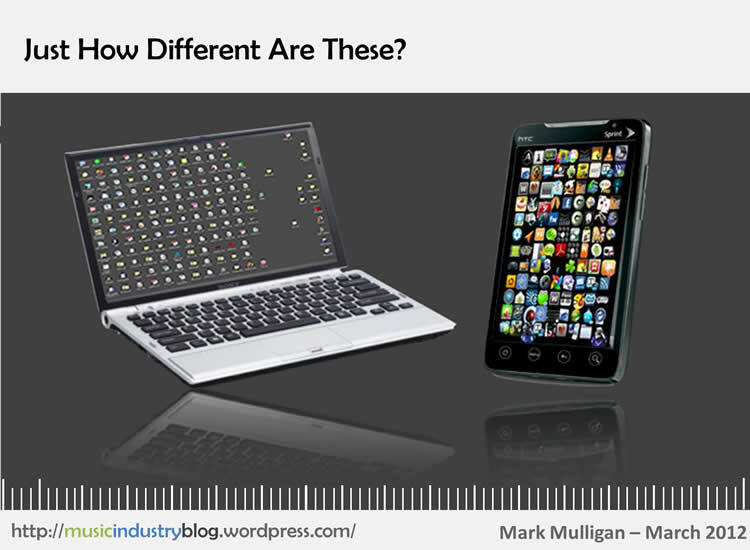 But Nokia’s flawed implementation of the proposition scared most of the marketplace away from the device bundle model. Beyond Oblivion nearly made it work before folding, and its subsequent offspring Boinc and Yonder are each still trying to prove the model. Rok Mobile are another new entrant. I still maintain that the device bundle is the best way Apple can extract full value from its recently acquired Beats Music asset but for now all eyes will be on Amazon to see if the model is finally ready for prime time (pun sort of intended) now that it has been sneaked in through the back door. Next week Beats Music will finally launch, after arguably the most hyped music service launch in the history of digital music. 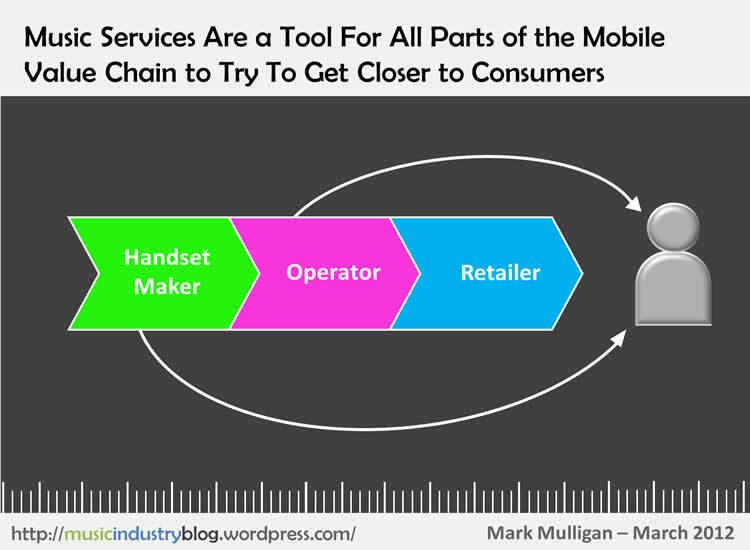 CEO Ian Rogers published a blog post over the weekend that dives into some of the thinking behind the service and some of its functionality. Early signs are that it is a well designed and programmed service, but that alone will not be enough to make it a success. Rogers cheekily labelled competitor services as ‘servers’ rather than services and there is no doubt that Beats Music has put addressing the Tyranny of Choice right at the heart of its strategic mission. Beats Music has invested heavily in a host of cool features and top quality editorial and deserves great credit for doing so, but it still won’t be enough. 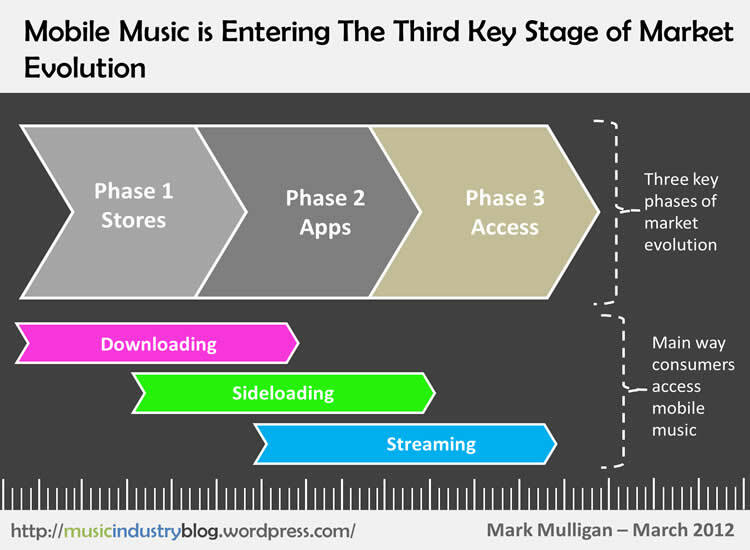 Beats Music is another 9.99 subscription service and 9.99 is still not, nor ever will be, a mass market consumer price point….at least not until years of inflation have taken effect. Just 5% of consumers currently pay for subscriptions in the US and the UK and the lion’s share of that is down to Spotify. It is a massive – i.e. currently impossible – challenge for Beats or any of its soon-to-be competitor AYCE subscription services to get the headline pricing down – that is instead the domain of a new breed of innovative services such as MusicQubed, Bloom.fm and Psonar. But where Beats does have the ability to at least make their offering feel cheaper is with bundling. On this front a lot has been made of Beats’ partnership with AT&T. Though it is great to have such a high profile partner pushing subscriptions into the US it feels like a missed opportunity. Instead of being a long term bundle, the AT&T deal is in fact a promotional partnership, with three months free before reverting to a full priced $15 p/m deal. 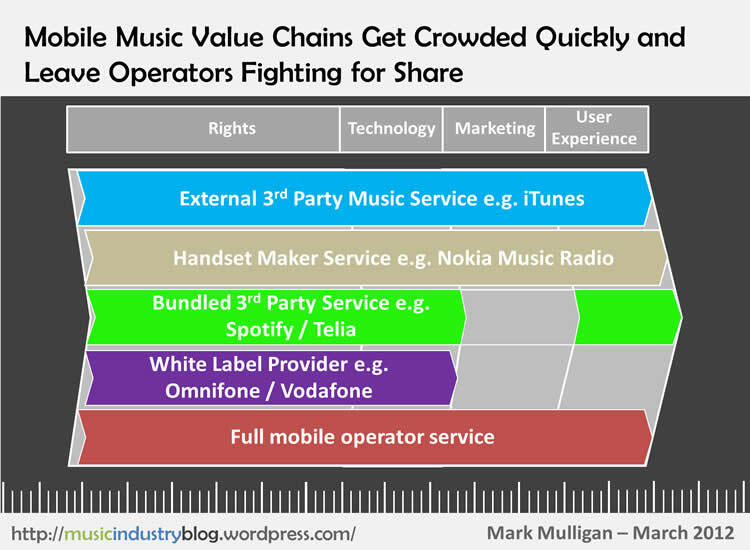 As we recommended in our Telco Bundling White Paper last year, the best practice is to transition to a subsidized bundle with the end user paying either nothing or a discounted rate (much preferable to labels). While a three month free trial is a fantastic way to deliver value and get users hooked, the leap from zero to $15 p/m is just too big. Granted the deal is an innovative ‘Family Plan’ but I am not convinced consumers will see the value. Core to the value proposition is being able to access the service across 5 people and 10 devices, which compared to other subscription services is strongly differentiated. 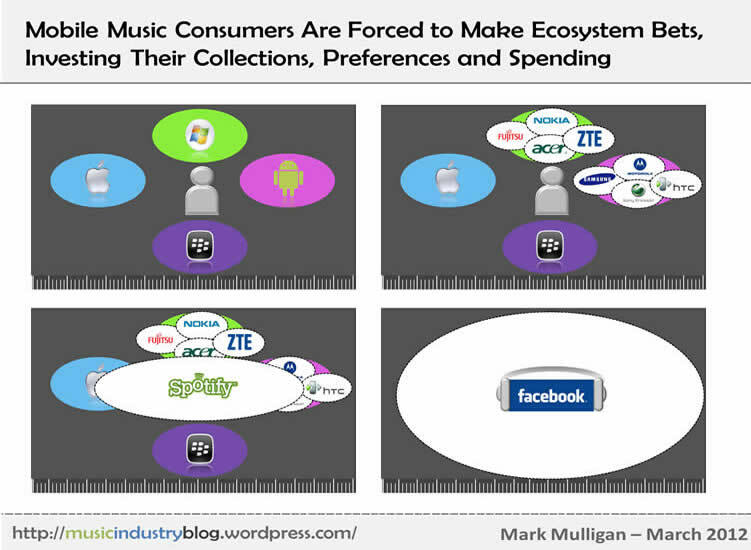 But multi-device value is actually the value of the label licenses not consumer value. Apple and Samsung customers do not pay a premium for every additional device they want to play music downloads they purchased from the iTunes and Play Stores. 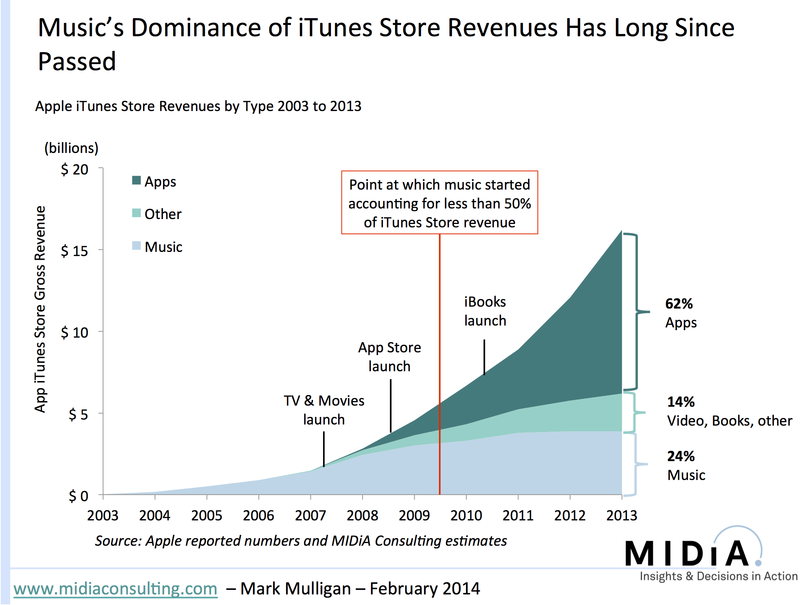 iTunes accounts are already inherently family plans in many households with no price premium. As I have been saying for years: we are in the per-person age, not the per device age. Consumers should not pay a premium for multiple device support. Labels need to accept the realities of the modern day multi device consumer and not try to slice the proverbial baloney. Also the Family Plan also raises the tricky issue of whether the fact that this would translate into $3 per head per month effectively means three times less rights pay out per track. 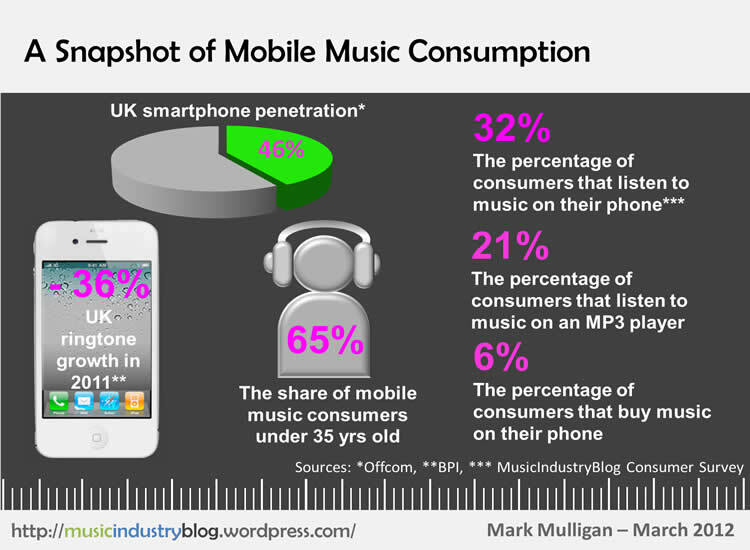 Big labels and publishers won’t feel the pinch so much as they’ll still be getting their 10%/20%/30% shares of revenue. In fact they’ll be 50% better off as it will be a share of $15 not $10. But artists and songwriters only have small catalogues of music so they’ll feel the impact of track play revenue being a share of $3 not $9.99. And given that a family is likely to have diverse tastes, especially between parents and kids, artists are unlikely to get plays across all of the family members, where of course a label with a diverse portfolio of artists will. But enough of the hurdles, I did promise with this blog entry’s title a solution. Despite all of the hype I do genuinely believe Beats Music could be a game changer if it is willing to properly leverage all of the assets at its disposal. Beats has a hugely valuable brand and route to market in its core headphone business. And although Beats is now facing fierce competition, it remains the stand out youth headphone brand, for now. As great a partner as AT&T may be, they’ll still most likely only reach the same high value, data plan power user, music aficionado that all the other subscription services have been super serving. And as such Beats Music will get far less bang for its buck than it should. Instead Beats Music should focus on hard bundling into Beats headphones with a 3 month free trial followed by a subsidized $5 12 month commitment subscription. It really is that simple. ..well the commercials aren’t but the proposition is. Among Beats’ headphone customer base are hundreds of thousands of young, brand conscious music consumers that value high quality music experiences and are not yet subscription converts. If Beats fully embraces its new family member and puts it at the heart of its core product range then Beats Music might just reach a whole swathe of new consumers that the incumbent subscription services have not yet managed to. If instead it treats Beats Music as an awkward digital appendage then it will wither on the vine. Here’s hoping Beats opts for the former.